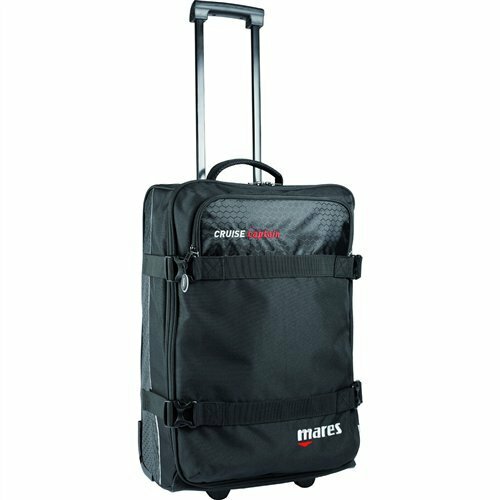 The Mares cruise Captain bag is the ideal wheeled bag for divers who travel. It is great to use as a carry-on and will fit in many airline cabin overhead bins. The cruise Captain is extremely lightweight weighing only 6.17lbs (2.8kg) and measures 14.17" x 8.66" x 21.65" (36cm X22 cm x 55cm) with a volume of 2,563 cubic inches (42 liters). the bag is made from PVC free cordura nylon for strength and durability. The telescoping handle and sturdy wheels make it very convenient for travel when maneuvering through busy airline, train or bus terminals. The expandable main compartment and pocket with zipper closures offers plenty of room to conveniently stow diving equipment. The bag is equipped with compression straps with Squeeze-Style" Side-Release buckles to lower the bags profile when traveling. Bag has a hard bottom design making it stable, resistant to wear and tear and able to stand-up when not attended to. Bag is equipped with a padded top grab handle for easy lifting. The main compartment zipper with duel sliders and branded zipper pulls provides easy access to the bags content. Bag is covered by a 24 month limited warranty.